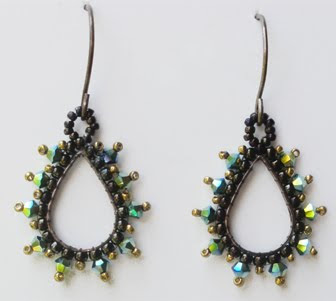 I designed these earrings to go with The Dazzled Necklace.If you had to choose which one. Would it be Style One? I vote for two too. 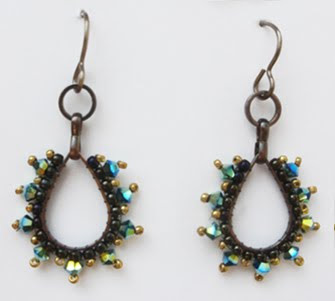 I like the little beaded link! Nr. 2 ist ein klein wenig besser, aber beide sind sehr hübsch. I like #2 with the little loop at the top! I'm always the one being different, but I think style one has a more finished, professional look. Thanks everyone for choosing a style. Style Two has been a favorite on facebook too! I vote for #1. I love the link u used as it reminds me of an industrail staple.....then lovely stylish beads.....good mix. I like #2--seems a little more feminine. #2 seems more balanced, as a design, to me. # 1 looks better to me. I like #2. Both are lovely but to my eye, #2 has a more pleasing shape. Yep, two. They look more "finished". Gorgeous!